Be sure to include contests and prizes at your golf tournament. Participants want to have something to shoot for. Reward a "closest to pin" or "longest drive" with a trophy or give-away. This makes the players want to stay around for the end of your event. This will make sure your get your message across to attendees. Golf related items like golf bags or drivers make great awards! If you're looking for unique ideas for your tournament prizes contact us! 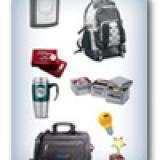 Let me help you buy promotional products that will make your golf tournament a success!